Too many green products solve environmental problems that consumers don't know exist. 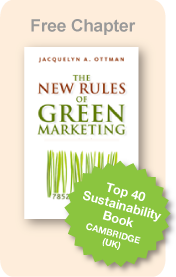 In this enlightening article, Ottman establishes the significance of understanding your customer's environmental interests, and identifies strategies for using green marketing as a vehicle for consumer education. The most relevant corporate green marketing communications campaigns will highlight product initiatives, as opposed greener processes and practices. Turn looming risks into opportunities to gain market share and win over stakeholders by following this article's principles: be transparent, take responsibility for life cycle impacts, and help consumers make the right choices. Using three illuminating case studies, Ms. Ottman explains how to prevent your green products from winding up in the green graveyard. This article laments the decision to end production of Ford’s Th!nk Mobility line and offers reasons why it has joined the green graveyard. In our consulting practice, we have invented a toolbox of ideas, strategies, and exercises we call the Getting to Zero(SM) Process for Eco-Innovation. This article discusses Getting to Zero(SM) and how to use it to stimulate new ideas. Contrary to what has been reported by the green marketing naysayers, demand for green products is growing; products such as Philips Marathon brand compact fluorescent. Toyota’s Prius, and Maytag’s front-loading Neptune washer prove why. Now is the time for designers to get involved in developing new products and services that represent functional substitutes for existing products with significantly less impact. In 1994, the first battery-less radio was invented to distribute information about AIDS in communities distant from electrical grids. Today it is being sold in Western markets for it’s sensibility. What other sensible products can cross the divide? We as marketers and advertisers have what it takes to slow the warming, but will we do it? This article offers suggestions for ways for making fighting climate change popular among the mainstream.